Check out our special Holy Thursday podcast with Brant Pitre on the Date of the Last Supper. 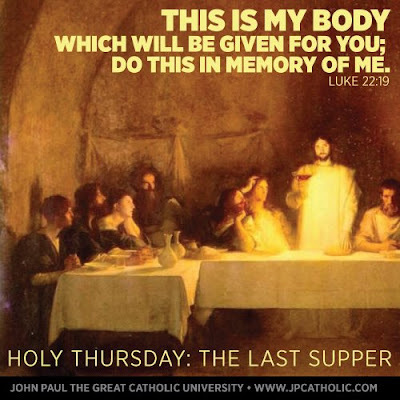 "The Last Supper is what transforms Jesus' execution into a sacrifice." So Scott Hahn frequently tells audiences. He is right of course. As he frequently observes, no one standing at the foot of the cross would have described what was going on as a sacrificial offering. They would have described it as an execution. What reveals the true meaning of Jesus' death? The Last Supper. In light of that, here I want to revisit a topic I've looked at before, namely, the imagery of "atonement" at the Last Supper. As Jesus makes clear--in multiple ways, in fact!--his death is what accomplishes the "forgiveness of sins". His Blood is "Poured Out"
Jesus' language of his blood being "poured out"--something found in all three Synoptic accounts of the Last Supper--evokes the Levitical law code. Not only does it call to mind the language of Leviticus 17, but also the fact that the blood of the sacrificial animals brought for atonement had to be "poured out" (cf. Lev 4:7, 18, 25, 30, 34). Notably, the ritual of pouring out blood is also linked with the Day of Atonement in the Dead Sea Scrolls (cf. 11Q19 15:3; 23:13). These texts provide strong support for the antiquity of the traditions found in the Mishna which also link the pouring out of blood to the Yom Kippur liturgy (cf. m. Yoma 5:4, 7; cf. also b. Yoma 56b). In fact, strikingly, certain sources explain that the blood was poured from cups. This is especially apparent in the Talmud (cf. b. Yoma 57b), though this is a much later source. However, there is a particularly striking parallel between Jesus’ Eucharistic words and Sirach 50:15, which explains that on the Day of Atonement the duties of the high priest apparently involved “pouring out” (ἐξέχεεν) the “blood of the grape” (αἵματος σταφυλῆς) from a “cup” (σπονδείου) (cf. Sir 50:15). That Jesus has spoken of his “blood” being “poured out” in connection with the wine in the “cup” is strikingly evocative of this text. In Isaiah 53 we read about the Suffering Servant who “poured out his soul to death. . . he bore the sin of many” (Isa 53:12). The Suffering Servant is clearly linked to atonement imagery. He is explicitly described as a “sin-offering,” who, like the scapegoat of Yom Kippur, is said to “bear iniquities" and "he bore the sin of many" (Isa 53:10, 12). Of course, it is widely accepted that Jesus' saying about his blood being "poured out for many" in Matthew and Mark (cf. Matt 26:27//Mark 14:24) is drawing on this prophecy. In the account of the Last Supper in 1 Corinthians 11, Paul does not mention Jesus’ blood being “poured out.” But this does not mean that he does not see it as having atoning value! First, it is possible that the very image of Jesus' "blood" would have evoked such imagery for Paul. Expiation is typically associated with Jesus' blood throughout the New Testament books, including in other Pauline letters (cf. Rom 3:25; 5:9; Eph 1:7; 2:13; Col 1:20; Heb 9:12, 14; 10:19, 29, 12:24; 13:12; 1 Pet 1:2, 19; 1 John 1:7; 5:6, 8; Rev 1:5; 5:9; 7:14; 12:11). Confirmation that Paul has this in mind may be seen in the following. That Jesus’ dies for others is explicitly stated in the Lukan version of the bread-saying: "This is my body which is given for you" (τοῦτό ἐστιν τὸ σῶμά μου τὸ ὑπὲρ ὑμῶν διδόμενον; Luke 22:19). While Paul simply has "for you" (ὑπὲρ ὑμῶν), omitting "given" (διδόμενον), most commentators rightly note that he probably intends the same meaning―Jesus is giving his life for others. Indeed, elsewhere Paul uses the preposition ὑπὲρ (="for") to describe Christ’s death as an expiatory sacrifice (e.g., 1 Cor 15:3; Rom 5:6, 8). An allusion to atonement imagery is thus likely present in his account. Of course, Matthew specifically has Jesus' describing his blood being poured out "for the forgiveness of sins". Some have seen here a reference to Isaiah 53, others to Jeremiah 31, and still others think both are in mind. It may be significant that Jesus describes himself not only as a sacrifice but also as an edible offering (i.e., he gives his “body” to be eaten). In this scholars we might have an allusion to the Passover sacrifice, which was a kind of peace-offering. That would be significant because Jesus' sacrifice would then be linked with the same kinds of sacrifice offered in Exodus 24--a passage clearly evoked by his words which link his "blood" to "covenant". "Why have you not eaten the sin offering in the place of the sanctuary, since it is a thing most holy and has been given to you that you may bear the iniquity of the congregation, to make atonement for them before the Lord?" (Lev 10:17). That eating of the sacrifice was an essential part of making atonement is thus recognized by many scholars of Israel's cultic laws [e.g., Milgrom (Leviticus 1-16, 638), Gane (Cult and Character, 96), and Levine (Leviticus, 62)]. By themselves imagery of “blood” being “poured out” and the eating of the sacrifice are merely possible points of contact with atonement terminology. However their appearance alongside each other within a passage containing allusions to the Suffering Servant (=a sin-offering) and the “covenant” ceremony of Exodus 24 makes an allusion to the eating of sin-offerings highly probable. No, I think what makes "the execution of Jesus" a sacrifice is that He went willingly. Frankly, I don't like the phrasing of that sentence, because it obscures the fact that He was in complete control at all times. Those 12+ legions of angels really were available, to say nothing of His own divine power. I remember as a sophomore reading "The Dream of the Rood" in Brit Lit. The professor said that this was a very different view of Christ than the one contemporary Christians have, so we might find it hard to understand; in the Anglo-Saxon period of English history, Jesus was seen as a young hero Who conquered through the Cross. I remembered wondering what church my professor attended, because I was completely at home with the Anglo Saxon rendition. Now I'm going to go re-read "The Dream of the Rood". No, I think what makes "the execution of Jesus" a sacrifice is that He went willingly. Can't argue with that. However, I think the point being made is that we could not participate in that sacrifice if Jesus had not transformed it into a Liturgical rite. Then it becomes a sacrifice which we can all offer.